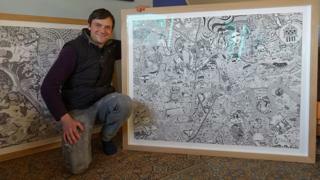 An artist who creates intricate hand-drawn maps has had his work accepted by three national permanent collections. Fuller's drawings of Bristol and London have been acquired by the Museum of London, Bristol Museum and Art Gallery and the British Library. He said his maps of London and Bristol were "cartographical love letters". Pat Hardy, from the Museum of London, said his "London Town" map would provide an "intriguing, unique, glimpse into the capital". And Tom Harper, antiquarian map curator at The British Library said it was "one of the most personal pieces of cartography I've ever seen". Fuller said he was "absolutely honoured and humbled" by the decisions to accept his work. Image caption London Town depicts "the emblematic landmarks but also the enchanting chaos" of the "crazy, pulsating capital city"
"I know my work will be accessed for research and educational purposes and I have so much enthusiasm for the institute that is the British Library I'm overwhelmed," Fuller - real name Gareth Wood - told BBC News. Drawing maps came naturally to the artist, who learned to navigate as a boy scout and was a keen explorer as a youth. "I was a map geek when I was about 14," he said. Fuller - an old family name - said "London Town" was "peppered with comments on contemporary culture and society" but "personal thoughts and memories are given almost equal prominence". The map of Bristol places "emphasis on how we live and our relationship to place and community" and is positive, despite the city's chequered past. He moved to live in the city six years ago. "The message of the map is of the city's fierce independence and that it is a city of inventors and makers," said Fuller. Mr Harper, from The British Library, said the works "go to show just how essential maps are in drawing a bond between who we are and the places we inhabit".